PostProm.org maintains a collection of thoughts, ideas, comments, and historical information documenting post prom activities, games, contests, rules, prizes, vendors, hall setup diagrams, community resources, and local sponsor lists; assembled by parent volunteers who have been actively involved with planning, organizing, and scheduling after prom parties for many years. 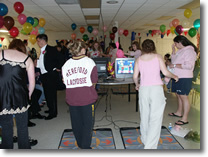 While most of the featured events took place in Baltimore County, Maryland, the content is being reorganized in order to serve as a more universal reference for students, teachers, school administrators, chaperones, parents, and other volunteers who may be planning an after prom party in their own communities. Information about previous post prom events can be found on our examples page, including descriptions of various after prom themes and decorations, pictures of some of the prizes given out to students, and lists of the games and activities presented for entertainment at each event. where is the hereford high school post prom site? Originally created in 2004, as a practical method to promote the Hereford High School Post Prom Party that year, hosting and production costs for the postprom.org Web site were donated until the fall of 2008 when the HHS Parent Teacher Student Association (PTSA) asked that we discontinue that relationship. Accordingly, the information on this Web site is no longer being provided on their behalf. Since most local PTA's and PTSA's are all volunteer organizations, with board members changing over time, references to past events and other historical information is now being offered as a service to the general public. The HHS Website can be difficult to navigate and current Post Prom information is not always available. However, after prom events are typically planned and sponsored by the PTSA. So, look for a PTSA link - under the Parents main menu item - to see what, if any, current information they may have posted.